Each of the pictures below are linked to each of my dogs, their individual page, achievements and any other notable information about them. 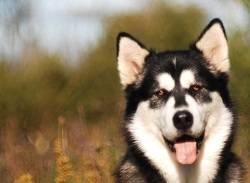 Their Alaskan Malamute pedigrees, pictures, titles, certificates, health records are in each of their sections. Three came from Canadian Alaskan Malamute breeder Yukonjak. Bert is mostly Wakon. 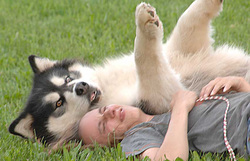 Bert is another huge Alaskan Malamute - again their is no such thing as a giant Alaskan Malamute, just an oversized or undersized one - but he is not related to them as he is AKC registered and his pedigree is entirely Wakon Alaskan Malamutes (AKC) and he is not a well dog. While I've shot thousands of pictures, photographs and images of the dogs (mine and other peoples), I used a few that I really like (I do tend to change their pictures frequently). I built their Web site to mainly teach the students how to build Web sites in Weebly, along with samples of photography for the photography course I teach. In the greater scheme of things, having a 'breeder web site' was not a bad idea for me, either - or for my dogs. I built the first web site, for the first dog in 2000 (although I'd been building Webs before, just not for dogs, kennels or breeders. These days, if you want your dogs found on the Internet, you are going to work for it. Not complicated work, but work. You should be able to use my Web as guide to building a breeder site, especially since I've used post 2010 theories, etc. Most Web sites are built from ideas, rules that circulated 1998 - 2005 - and those rules have all but disappeared. In fact, some became the complete opposite and seriously degrade both the quality of experience for the user and any search engine results placing (SERPs) to their Web site they might get as a breeder. Eventually I will probably rip this particular page apart and make a real 'help the dog breeder build a Web site page). While a number of breeders are using things like Weebly, they aren't using them very effectively. Either way, enjoy the Web site for what it is - a tribute to my own dogs. 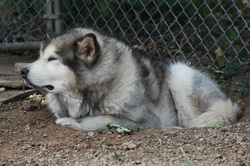 I have also helped foster several Alaskan Malamutes for adoption, and eventually I hope to put a page up for each of them, as time permits. All four of my current purebred registered Alaskan Malamutes are, or have been involved with many working events. Each dog is different, has their own skill and personality, but are immensely loving and interested in being a part of everything!